If you are reading this you obviously want to know these 7 Afghan Hound temperament traits. Below we provide more than just behavior and Afghan Hound personality stuff. Before we tackle the Afgan Hound's temperament and personality here are some of its physical characteristics. Afghan Hounds are instantly recognizable with their tall stature, lean body, elegant build and long silky coat. This gorgeous breed owes its origins to the rocky terrain of Afghanistan. The regal Afghan Hound is aristocratic in appearance. It has a heavy coat and is generally between 25 – 27 inches high and weighs 50 – 60 pounds on average. The Afghan Hound has large distinctive paw pads that are suitable to withstand the harsh Afghan environment. The Afghan Hound temperament is not the right fit for everyone, but they make good pets with the right owner. The Afghan Hound is a very loyal dog that craves personal attention. Do not leave the dog at home alone for a long period of time, since they may express their dissatisfaction by becoming destructive. Some Afghan Hounds are playful and have a silly streak that delights their owners. If you decide on an Afghan Hound, be prepared for a dog that loves to run and needs the space to do so on a daily basis. Because of this, they require room to move around, so apartment living is not recommended. A safe, enclosed place to gallop, preferably a yard with a high fence will do best. However, Afghan Hounds are are good jumpers and they love to run, so if you fence in the yard make sure the fence is high enough so they don’t take off. Caution: they are instinctive chasers so they may be at risk of getting hit by a car. This breed is very emotionally sensitive to stress and change. Keeping them on a regular schedule is a good idea. They have a low tolerance for pain as well, so they do better with older children who are likely to exercise more care and less rough-play. Some people compare the personality of an Afghan Hound to that of a cat. While they may have enjoyed cuddling as a puppy, as they get older they tend to become somewhat aloof. They will let their owner know when they crave affection and when they want to be left alone. Afghan Hounds can be shy or even downright suspicious of new situations if they are not socialized enough when they are young. Make sure to expose them to new situations and people as a puppy. Afghan Hounds have a strong instinct to run, and they are fast. Walking them off the leash is not advisable. They can be out of sight in just seconds. If you choose an Afghan Hound, be aware that they have an extremely strong hunting instinct that makes them unsuitable for households with small pets like rabbits and kittens. This breed is gentle with people and they can coexist with other dogs if trained to do so. Afghan Hounds were highly valued for their independent thinking when keeping prey at bay while awaiting the hunters. As a result, that independence can become a stubborn streak during training. However, their loyalty can make the Afghan Hound want to please its owner and respond to simple commands. 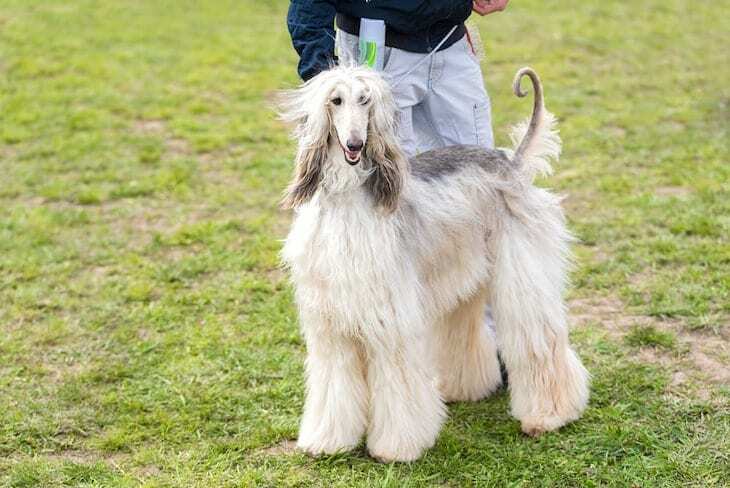 Obedience training for Afghan Hound dogs requires patience and persuasiveness. They can become defensive in response to leash jerking by bracing their legs and refusing to walk. Their independent streak makes them notoriously hard to train. Positive reinforcement is best with food, treats, and praise. You can find helpful and effective training resources at Secrets to Dog Training. Check them out. You can find the ideal Afghan Hound puppy online by viewing pictures and studying the details of each dog offered for sale. Since the breed can be difficult to train, some people opt for an adult dog that is already trained Afghan Hound through rescue and adoption services. If you go through a breeder with American Kennel Club (AKC) certified Afghan Hound puppies for sale, you will probably pay top dollar. 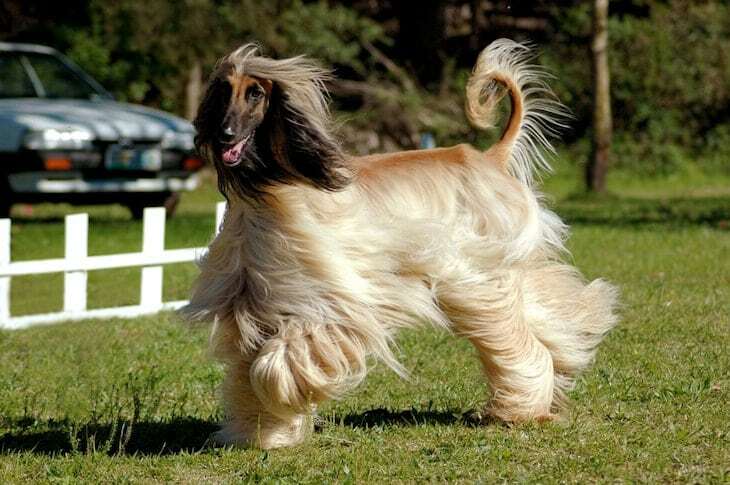 The Afghan Hound price will depend on the location of the breeder, the breeder’s reputation, the size of the litter, the lineage of the puppy and the popularity of the breed. You can find AKC registered Afghan Hound puppies for sale at online sources like Puppy Find. Select a puppy by the breed and your state. You will find pictures of the dogs that are currently available, as well as the gender, the age, and the price. The average price of an Afghan Hound puppy on Next Day Pets is $1,350. The price of an Afghan Hound ranges from to over $2,400 for an AKC certified dog. The Afghan Hound Club of America will help you find a puppy from a reputable breeder. Afghan Hound breeders are listed by state. The Club also provides information about whether or not stud service is available, and if the breeder is an AKC Breeder of Merit. If you decide to rescue or adopt an Afghan Hound, you will be doing a good deed. You will also pay less money and you can choose a trained dog that is out of the rambunctious puppy stage. Another advantage of a rescue or adopted adult is that the dog's personality is already developed, so there are no surprises. To rescue or adopt an Afghan Hound, try sites like AdoptaPet.com. The beautiful coat of the Afghan Hound needs close attention. Ideally, the dog should be groomed for an hour twice weekly. You may have to buy special grooming equipment. They should be bathed weekly and their ear passages need cleaning. Afghan Hounds require a healthy diet with a good amount of real chicken, beef, turkey, and fish. Like other sighthounds, this breed is especially sensitive to anesthesia. They are also sensitive to pain, so a soft, comfortable bed is recommended. 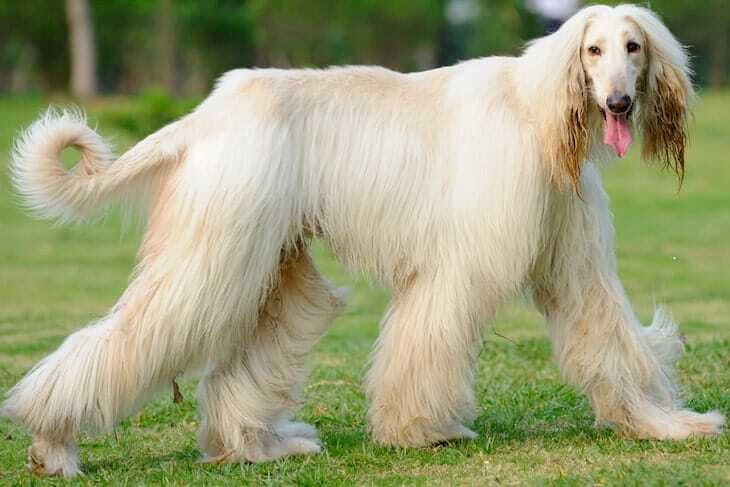 The tall, slender Afghan Hound is not for everyone, but with the right matchup of owner and dog, they can make good pets. Before you get an Afghan Hound, you have to commit grooming their beautiful coat a couple of times every week. Afghan Hounds can be affectionate on their own terms, but some people find it frustrating when they do not always come when called. Keep in mind that this breed does not like to be left alone for long periods of time. If you love the elegant look of the Afghan Hound, spend enough time with your dog and you do not have young children or small pets around, you may consider this breed. You should also have an enclosed yard for exercise. Afghan Hounds are difficult to train, so you must be willing to take the puppy to obedience training when the dog is young.